These are my twin sons. We're Big Top Gun fans! I bought the Top Gun jumpsuit online and ordered patches with MAVERICK and GOOSE and added them to the jumpsuits. I bought children's Football helmets and then spray painted them. I used my Cricut craft machine to make templates for the decals and cut them out in vinyl as well as the Decals for the back of the costume. 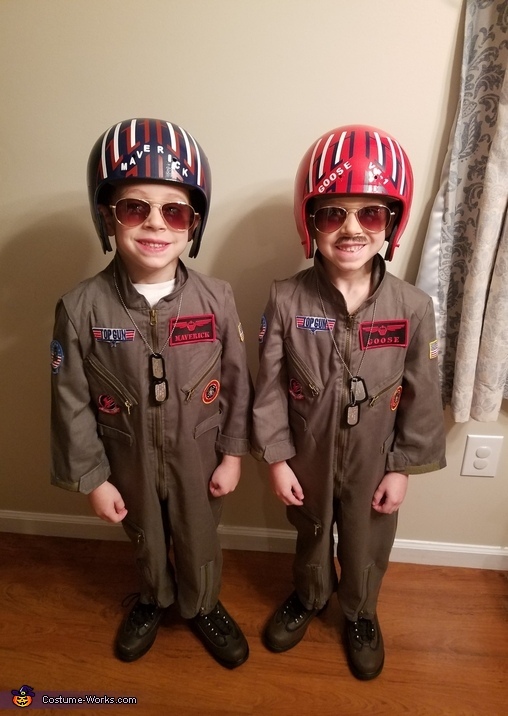 Add children's aviator shades and Dog tags with Pete "Maverick" Mitchell and Nick "Goose" Bradshaw to complete their look. Used waterproof eyeliner to Draw on Goose's mustache so it would last all day. All totaled each costume cost about $100 or $200 for both.